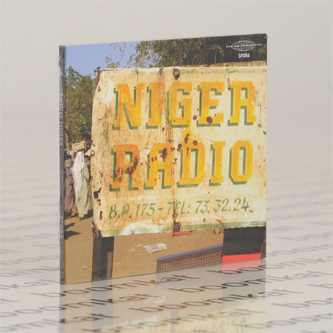 Sublime Frequencies decamp to Niger for the latest in their incredible Radio series. As you'd hope, it's a massively ear-opening experience, collaging choice fragments and passages recorded directly from transmissions by the country's first station, Radio Niger. "In 1979, the government established the Broadcasting Corporation of Niger State (BCNS). Today, Radio Niger is where the country’s range of ethnicities, with their disparate customs of language and music, combine to create an astonishingly complex sonic patchwork: Bawdy, drunken sages and storytellers wandering into the studio; local shout-outs to girlfriends and family members; comedy skits juxtaposed with Zarma/Songhai mollo (a regional stringed instrument) and Denke-denke mollo from neighboring Burkina Faso dissolving into Tuareg guitar blues trance. News snippets from RFI and the BBC vie for supremacy with Hausa women's ensembles; Malian Kora collides with Zarma Koranic transmissions; lo-fi cassettes from the marketplace bump up against animist Bori folk dirges and the vapid autotune stylings of modern Nigerian pop. DJs bring an improvisational element to local radio: singing along with tracks live on air; creating live multichannel compositions and avant-collage cutups; and generally preserving the human element that has long since disappeared from corporate western radio. In short, Radio Niger is outlaw radio, broadcast with freedom and spontaneity, and bathed in an arid fidelity that reveals the region’s character and landscape."